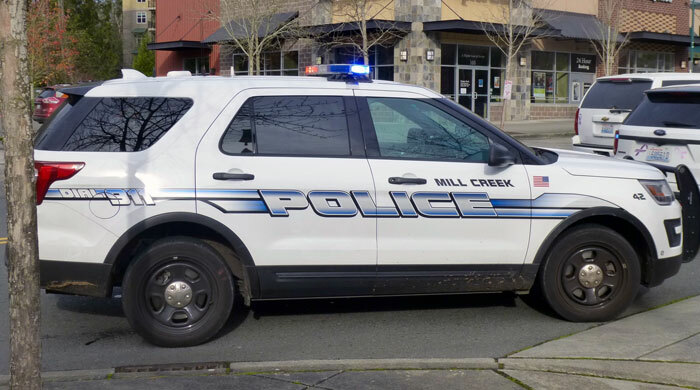 According to the latest Mill Creek Police Blotter, a total of 424 responses were reported the week of March 22 to March 28, 2019. 03:22:55 - 13300 BLK BOTHELL EVERETT HWY: Officers responded to a report of a domestic situation in the 13300 block of Bothell‐Everett Hwy. It was determined that no crime occurred and both parties were released. 11:19:27 - 12900 BLK 19TH AVE SE: Officers arrested a warrant subject. The incident occurred near the 12900 block of Bothell Everett Hwy. 13:59:51 - 16600 BLK BOTHELL EVERETT HWY: A Marysville man was arrested for Use of Drug paraphernalia in the 16600 block of Bothell Everett Hwy., and the case was forwarded to CPS for review. 14:42:47 - 14000 BLK NORTH CREEK DR: Mill Creek Police responded to a welfare check of a male resident near the 14000 block of North Creek Drive. Upon arrival, Mill Creek Police discovered the male was deceased. 12:23:58 - 3200 BLK 132ND ST SE: Officers contacted a suspicious vehicle in the 3200 block of 132nd St SE and arrested the occupant on a warrant out of Bellevue PD. His custody was transferred to the Bellevue PD for booking in King County. 13:35:49 - 14300 BLK NORTH CREEK DR: An officer responded to a vehicle prowl in the 14300 block of North Creek Dr.
15:18:35 - 12900 BLK 19TH AVE SE: Officers contacted a slumper in the 12900 block of 19th Ave SE. A 27 year old male was arrested for use of drug paraphernalia and obstructing officers. The vehicle was impounded, pending a search warrant. 15:49:02 - 1000 BLK 153RD ST SE: A woman reported that her vehicle had been struck by another unknown vehicle while it was parked in the 1000 block of 153 Street SE. 2:52:48 - 2100 BLK 162ND PL SE: Police contacted a 25 year old Mill Creek female in the 2100 block of 162nd Pl SE who was dealing with a mental crisis. A report was taken and a firearm was released by the female to police to be placed in safekeeping. 2:56:48 - 1800 BLK MILL CREEK RD: Police stopped a vehicle for traffic violations in the 1600 block of Mill Creek Road. Subsequent to investigation, a 29 year old male was booked for DUI. 02:47:22 - 1400 BLK 164TH ST SW: A 28 year old Edmonds male was arrested in the 1400 block of 164th ST SW and booked into the Snohomish County Jail for Physical Control. 10:17:22 - 16400 BLK 14TH AVE SE: Multiple residents in the 16400 block of 14th AVE SE had their unlocked vehicles prowled. 13:11:03 - 16200 BLK BOTHELL EVERETT HWY: A felony theft occurred near the 16200 block of SR‐527. 14:06:41 - 15400 BLK 3RD DR SE: Officers responded to a court order violation in the 15400 block of 3rd Dr SE. A 43 year old male from Mill Creek was arrested for violating the order. Due to the male's level of alcohol in his system he was transported to the hospital. The male was later booked into the Snohomish County Jail. 06:32:47 - 13500 BLK 33RD DR SE: A Mill Creek officer responded to a vehicle theft that had just occurred in the 13500 block of 33rd DR SE. A male resident was warming up his vehicle when it was stolen. 6:57:07 - 2300 BLK 136TH PL SE: Police took an identity theft report from the 2300 block of 136th Place SE. 10:55:49 - 2700 BLK VILLAGE GREEN DR: PSO took a report of one dog biting another dog in the 2700 block of Village Green Dr.
02:17:52 - 12000 BLK ANDREW SATER RD: An officer assisted SCSO with a warrant service in the 12000 block of Andrew Sater Rd. 7:45:07 - 1500 BLK 136TH ST SE: A laptop was reported missing in the 1500 block of 136th ST SE. A theft report was taken. 10:57:43 - 2500 BLK 132ND ST SE: PSO took custody of a stray dog at 2500 block of 132nd St. SE and transported it the animal to Everett Animal Shelter. 11:35:12 - 16300 BLK BOTHELL EVERETT HWY: A Mill Creek officer responded to a theft of tools from a local business in the 16300 block of Bothell‐Everett Hwy. 13:22:26 - 2300 BLK SEATTLE HILL RD: An officer attempted to stop a speeding vehicle in the area of Seattle Hill RD/23rd AVE SE. The vehicle failed to stop and conducted a U turn and began driving recklessly in an attempt to evade police. Other traffic in the area bogged down, preventing the officer from catching up to the fleeing vehicle, which was not positively identified. 18:41:27 - 14000 BLK NORTH CREEK DR: Officers responded to a report of a verbal domestic in the 14000 block of North Creek Dr. A male and female were contacted regarding a loud argument. No crime occurred. 23:10:48 - 15000 BLK MAIN ST: Officers responded to the theft of a wallet in the 15000 block of Main St.
01:45:03 - 900 BLK 130TH ST SW: The Mill Creek K9 Unit responded to the 900 block of 130th St SW and assisted the Snohomish County Sheriff’s Office. A female was subsequently tracked and located by K9 Bagira. 09:43:32 - 2000 BLK 132ND ST SE: Officers arrested a 65 year old suspect after stealing in the 2000 block of 132ND ST SE. Officers discovered that he had been stealing from the location several times over the past week. He was booked into the county jail. 13:06:59 - 16300 BLK BOTHELL EVERETT HWY: Officers arrested a subject in the 16300 block of Bothell Everett HWY who was trying to sell stolen property. The suspect had posted the stolen tools online and the victim made arrangements to "buy" the stolen items. He then notified the police and the suspect is facing felony charges related to selling stolen property. 22:50:41 - 13100 BLK 35TH AVE SE: An officer initiated a traffic stop in the 13100 block of 35th AVE SE on a male driver with improper tabs. The tabs were removed and the male was given a verbal warning. 10:11:38 - 15400 BLK COUNTRY CLUB DR: An officer responded to a vehicle prowl in the 15400 block of County Club Dr.
13:22:21 - 14400 BLK NORTH CREEK DR: Officers responded to a domestic disturbance near the 14400 block of North Creek Dr.
2:18:40 - 15300 BLK BOTHELL EVERETT HWY: Police initiated a traffic stop in the 15300 block of Bothell Everett Highway. Subsequent to identifying the driver, a 44 year old male was arrested and booked into Snohomish County Jail for Felony and Misdemeanor warrants. Click on this link to see the March 22nd to March 28th, 2019, Mill Creek Police Blotter.